For anyone who has been looking to buy or sell a home in Page, Arizona we have all noticed the same thing…. shrinking inventory. This past week saw a couple of homes come on the market which changed our numbers a bit so I decided to revisit what has gone on here the past three years. Most of us in the area have noticed the sharp uptick in our tourism numbers the past 3 years. With that comes buyers who want to open VRBO’s, more teachers, more business owners, more workers, etc which has had our inventory of homes for sale dwindling. Backing up to September of 2015, between Page and Greenehaven, we had 55 active homes for sale on the market of which 47 were in Page. On August 1st of 2018 we hit a low point in Page with active listings of homes for sale at mere 13. Thankfully over the past six weeks we have seen a few more homes come up for sale and today have 17 in Page. Because of the low inventory, and high demand, the average sold price per square foot for homes in Page has gone from @ $127.00 psf in September 2015 to $156.00 psf in August of 2018. 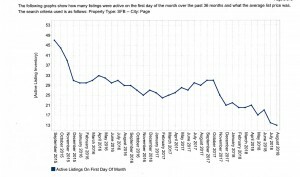 The trend has continued from August 1st to September 7th with the average price hovering about the same. For Greenehaven, Lake Powell View Estates, the trends have been different over the last 3 years. Eight homes were on the market in September of 2015 and today there are 7. 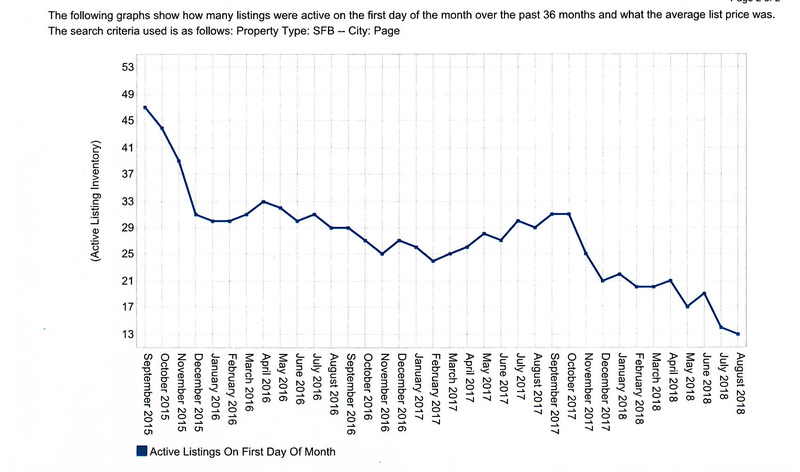 The numbers have jumped up and down and bit but seem to be mostly steady for active listings. As far as manufactured homes the numbers also show a decrease in active homes for sale. In September of 2015 there were 13 manufactured homes in Page on the market. As of August 1st, 2018 there were 2 and today there are 3. A couple of take-a-ways here. 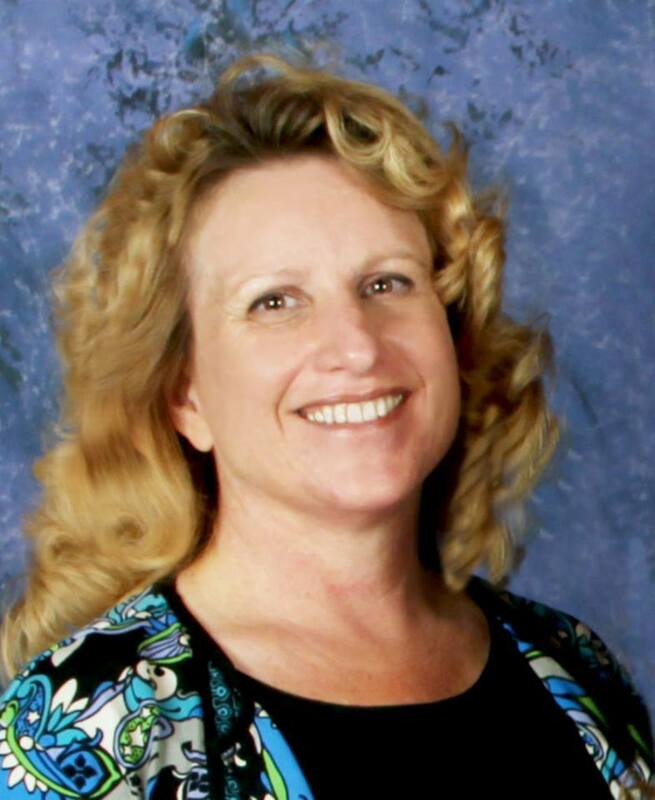 1) If you are thinking about selling your Page AZ home this is a great time. Make sure you get a good price analysis from an agent… we can handle that! 2) If you are thinking about buying in Page some things to consider. Several homes have sold as they are just coming on the market so have your required pre-qualification letter from your lender ready, or a statement of good funds “cash” from your bank. We have to have either one of those to legally put a offer in on a property in Arizona and it is a darn good idea in Utah. 3) Many homes coming on the market are either rented, in which case notice is required to see them, or the owners are still living in them. You can click on our “search MLS” feature to make a list of homes you would like to see, then give us a call to set them up. 4) Oh, did I mention, get your pre-qualification? There are several great lenders who do a lot of work in the Page Lake Powell area. We can send you contract information for them so you can get started. Fall is almost here ~ great time to look for homes! The Page Lake Powell real estate market has been picking up steadily the last couple of years. The number of homes on the market now is 1/4 of what it was in 2015 so it is important, if you are looking to buy to have all of your ducks in a row before starting the search. If you are looking to sell, make sure you have a good agent who is going to help you get your home ready to show and give good guidance on pricing strategies.